A R Adams' jnr and snr. A.R. 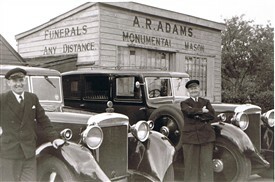 Adams Funeral Directors Ltd was established in the East End of London in 1900. The company was set up by 19 year old Archibald Richard Adams and has been passed down through the years as a family trade. Now in its 4th generation, A.R. Adams continues to serve the communities of Rayleigh, Thundersley, Thorpe Bay and their surrounding areas and is proud to remain a family business. The first branch opened at 187 Campbell Road, Bow in 1900 and soon expanded across London’s East End with offices opening in Poplar and Leytonstone. Archibald’s brothers were all found work within the company, each managing a branch of their own. 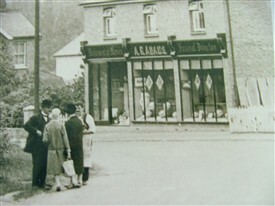 In 1915 Archibald moved to Thundersley, Essex and opened a branch on Rayleigh Road. The company later established itself in Rayleigh High Street in the early 1930's - where it has remained ever since. It is rumoured to be the longest surviving business in Rayleigh High Street today. In 1922, Archibald was elected president of the British Undertakers' Association - which later became known as the National Association of Funeral Directors. He was a well known figure in the London and Essex Communities, being the first chairman of Benfleet UDC and The Chairman of The County Juvenile bench at Southend-on –Sea. He was also a leading figurehead in the local Masonic lodges and was also offered the role of Mayor of Poplar, but turned it down due to other commitments. 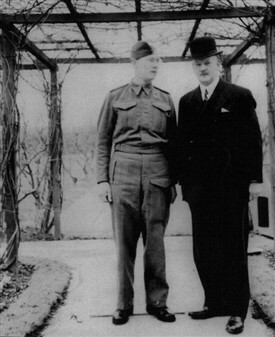 Upon his death in 1948, the establishment was taken over by his son, also Archibald Richard Adams who was previously employed with the company prior to serving as a soldier in World War Two. The east-end offices were sold in the late 1940’s. 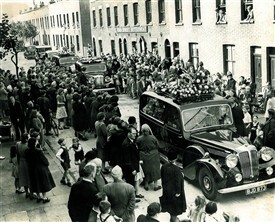 During their time in the East-End, the Adams family conducted many funerals including that of politician Will Crooks and the Bundle woman of Bow, Clara Grant. A.R. 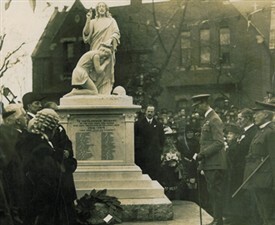 Adams were also the monumental masons for two war memorials that are still standing in London today. One of these was dedicated to the 18 children who were killed on June 13th 1917 when a bomb hit their school on Upper North Street, Poplar. 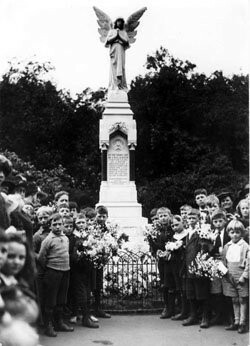 The attack, which was the first ever civilian air-raid of the war, left the East-End devastated. A public funeral ceremony was held and a personal message sent from the King was read to the mourners. A.R. Adams has always maintained a traditional fleet of funeral cars and has in the past run Austin Princesses, Daimler DS420s and more recently Daimler Jaguars. In 2010, A.R. Adams celebrated their 110th anniversary with the opening of a new branch in Thorpe Bay Broadway. They continue running their business today, giving the families in their care a professional, dignified service with a personal touch. 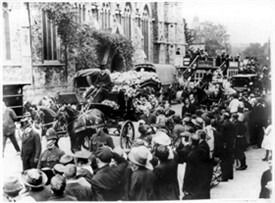 As well as providing the more traditional horse drawn hearse funerals, A.R. Adams can offer earth burials and a variety of other modern alternatives. They also offer Pre-Need Funeral Arrangements for people who wish to pre-arrange their funeral service. This page was added by A R Adams on 18/04/2012.